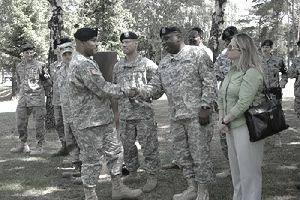 U.S. Army soldiers can be the recipients of a variety of awards, decorations, achievements, PFT scores, and badges for their military service, especially when defending the country in times of conflict. The goal of the Army's award program is to enhance mission accomplishment by identifying excellence of both military and civilian members of the force and motivating them to high levels of performance and service. The awards program allows for an objective grading method for soldiers in the Army in promotable status. This new system of promotion points was developed in 2011 and updated in 2015. As you advance your training and skills throughout your career, the parachute badge, explosive ordnance disposal badge, and recruiter badge levels, so do the points. For instance, the basic parachute badge is 10 points, the senior parachute badge is 15 points, and the master parachute badge is 20 points. As the EOD professional advances in his/her training and skill level, the EOD career field allows the specialist to grow from basic EOD which is worth 10 points, to the senior EOD worth 15 points, as well as the master EOD which is worth 20 points toward promotion. This occupational specialty gains extra points due to its hazardous nature. The basic parachutist can receive an extra 20 points, the senior parachutist can receive an extra 25 points, and the master parachutist can receive an additional 30 points when in hazardous duty areas conducting difficult training or real-world combat missions. For three years of faithful service by exhibiting exemplary conduct, efficiency, and fidelity, enlisted members are eligible for the Army Good Conduct Medal. However, if the term of service being reviewed for advancement does not meet the three-year term to be eligible for the AGCM, the added points cannot be used for the current promotion board. The period of service is used to determine eligibility for promotion points (orders issued late do not result in a retroactive promotion point adjustment). The date of the order or ending period, whichever is later, will be used to determine eligibility for promotion points on all remaining awards (for example, Army Achievement Medal, Army Commendation Medal, and Meritorious Service Medal). Awards and decorations earned in other U.S. Uniformed Services receive the same points as corresponding/ equivalent Army awards. For an online calculator to determine your promotion/advancement number, see the link for an NCO Support Calculator and Work Sheet. What Bonuses are Available to Active Navy Enlistees?